The invention of the ball point pen is often credited to Laszlo Jozsef Biro, a Hungarian journalist who noticed that the ink used in newspaper printing dried quickly and left the paper smudge-free. Biro patented his idea in 1938. However there was a much earlier patent owned by John Loud, an American leather tanner. 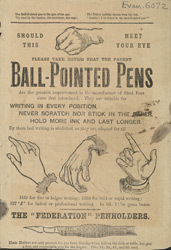 He invented a pen with a small ballbearing in the tip that rotated, picking up ink, and applied the ink to the paper. Biro made the ballpoint pen a household name but he wasn’t the first to have the idea!